In the biggest Kotaku Deals roundup so far this year, we've got pre-order discounts on all the biggest games of 2014, deals on PS+ and LIVE subscriptions, Xbox One bundles and the Playstation 4 in stock, a new Humble Weekly, the new Playstation Vita up for pre-order, your PSN/LIVE/eShop updates, and more. 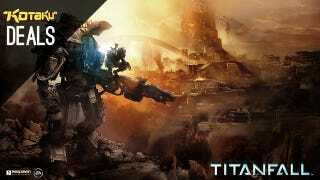 Titanfall is imminent, its beta sign-up is live, and pre-order discounts abound. Lock up your copy so you can jump in on day one and save money at the same time. If you need to re-up your various gaming subscriptions, Microsoft will sell you a year of Xbox Live Gold for $40, or you can get a $10 PlayStation promo code with your $50 purchase of PlayStation Plus from Best Buy. Walmart not only has Xbox Ones in stock; they'll throw in a free game. Choose from Call of Duty: Ghosts, Battlefield 4, Madden 25, or NBA 2K14. Shane is one of the best Westerns ever, and yes, I am in fact named after it. Grab it on blu-ray for $9 today. Shameless promotion. If you're on the east coast, you probably wish this deal had started a few days ago, but regardless, Amazon is offering big discounts today on coats and jackets. Pocket Keylock: PocketSensor ($1) | Google Play | Normally $2 | Automatically lock your phone when you put it in your pocket.